The independent social project ‘MarAzul’ started in 2003 when Mestre Joãozinho da Figueira was living in Maputo and started offering free classes to children at the Penha Palhota. The Penha Palhota was an area by the sea, with the shade of coconut trees, but was full of rubbish, so the first step was to buy lots of brooms and start cleaning! The classes are not just about capoeira – the children do a variety of activities including learning the musical instruments and songs from capoeira, African dance, drawing, group games, and thematic workshops where they explore different topics relating to health, hygiene, environment and education. 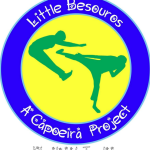 Capoeira MarAzul is a company limited by guarantee registered in England and Wales, No 6308976.